a. Prescribed burns generally are not the answer because; (i) they cost a lot of money and must be repeated often compared to the free-of-cost year-round mixed-herbivory method proposed in this PLAN, and (ii) prescribed burns release even more sequestered carbon compounds into the atmosphere, and (iii) prescribed burns can quickly turn into dangerous uncontrolled wildfires, and (iv) more burning is illogical when a mixed herbivory program can accomplish much of the needed 1-hr. fuel abatement, especially in remote rugged areas (aka: 'firesheds') where aerial fire suppression costs are about $1-Million/hour. It's important to note that: When native Americans used fire to manage the landscape, there were about 100-million more large-bodied herbivores grazing on the landscape than today. Those now missing native-species herbivores consumed about 273-Million tons of annual grass and brush (1-hour fuels), based on an average grazing of 15-lbs/day across various native species herbivores. 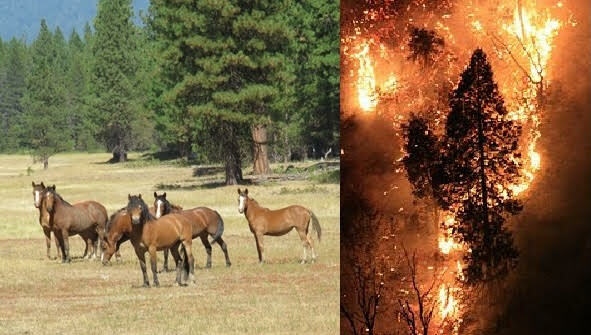 The best science informs us that when native-species herbivores are depleted, catastrophic wildfire evolves. Reducing the current prodigious 1-hour fuel loading requires the reestablishment and re-wilding of; (i) large-bodied native-species herbivores (cervids and wild horses); and (ii) applying intelligent application of invasive-species grazing herbivores (cattle, sheep, goats) into suitable areas that do not contain abundant predators or sensitive ecosystems with rare and threatened native flora. We know that the key in using any 'invasive species' of herbivore is careful application and management of their deployment. This lesson was learned in Salem, Oregon. Cattle and sheep can present the same problem to some extent or another as well. Unfortunately, we are having to address all of the intentional misinformation put into narratives by the BLM about native-species American wild horses, which do not harm riparian areas, and are actually used in Europe to reestablish riparian areas as we seen in This Video. a. Forests must be managed by experienced managers who have a holistic approach to forest management. Overstocked (high tree densities) forests must be culled so tree densities are optimal (based on species and carrying capacity of landscape) in order to preserve water and light resources for the best trees and this requires intelligent thinning. In ecologically sensitive areas containing rare flora and fauna, domestic draft horses have been well-proven to be a successful method for both logging and thinning in ecological sensitive forests. In other less sensitive areas, traditional methods (mechanized) can be employed with proven success. b. Access Roads: Fewer access roads are needed when logging and thinning the interior areas of ecologically sensitive forests and wilderness areas is accomplished using horse logging as seen in just one of many videos on this subject (OPB Video on Horse Logging In Oregon). For other non-ecologically sensitive areas, traditional well-designed and maintained 2-blade (two track) roads provide access into and around forest areas and also provide needed points of access for wildfire suppression by ground crews. 3. Wildfire Suppression: With the assumption that the foregoing programs and methods are implemented, full wildfire suppression is logical and made far more effective by the implementation of the best-practices as outlined herein above, and therefore must be set as established policy by all agencies.